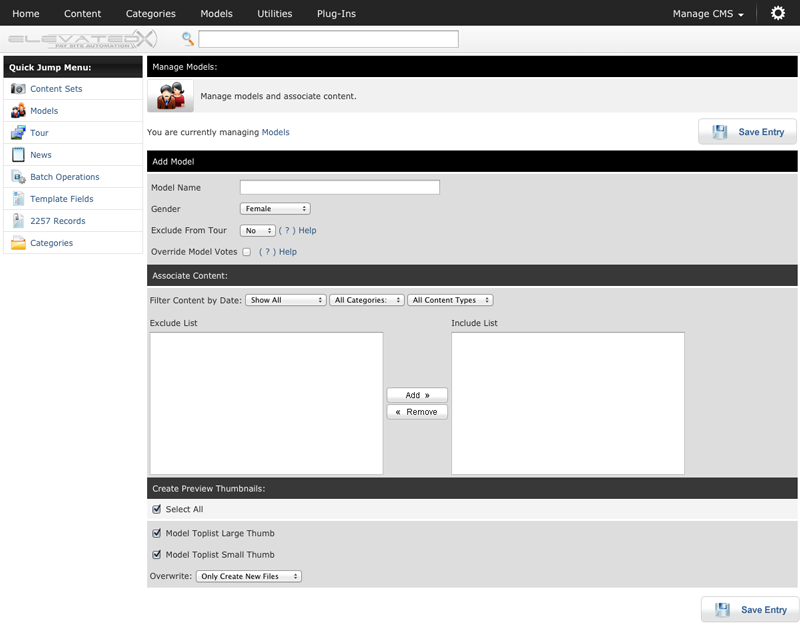 Step 1) Rollover the "Models" Tab at the top of the page (or Plug-Ins >> Models >> Manage). Step 2) Click "Add a New Model/Add a New Entry" The following page displays a field for adding a new model. Step 3) Enter the Model's name and select Gender (Male|Female|Transgender), Select whether or not the model should appear on tours areas, and if you want to override the votes for this model. Step 4) View the list of sets that have been imported for this site. Highlight set names in the Exclude List and Click "Add" to create an Association between the model and the selected set(s). To select more than one set name at a time, hold down the Ctrl button on your keyboard. Step 5) Create Preview Thumbnails for yout your models. If you select the Model Toplist Large and Small Thumb options the system will create thumbnails for these models automatically. Model thumbs by default are Position 16(Large) and 17(Small). NOTE - If the Models tab is not visible, go to Plug-Ins and make sure the plugin is enabled. Press the Save Entry button and wait for the system to finish.